By Alan Green in VectorVest on 27th June 2017 . 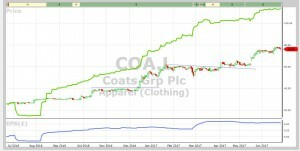 Coats Group Plc (COA.L), formerly Guinness Peat Group plc, is a UK-based company engaged in industrial thread and consumer textile crafts. The Company serves industries, such as apparel, footwear and accessories, technical threads and engineered yarns. COA supports consumers in the crafts activities, including knitting, crochet, embroidery, patchwork and quilting, and sewing. Product offerings include threads, zips, yarns and embroidery, while brands include Rowan, Anchor, Drima, Seta Reale, Royal Paris, Susan Bates and Dual Duty XP. The Company owns over 70 manufacturing facilities, which serve industrial and crafts customers across six continents. Following a solid set of full-year results in February, COA published a trading update on May 17th for the period Jan 1st to April 30th 2017. Group sales rose 5% over the period, driven by a stronger than anticipated performance in the industrial division (up 7%). Overall, COA said it had been a “strong start to the year”, and as a result it expects to deliver 2017 full year results ahead of management’s previous expectations. COA expects to achieve this through initiatives to deliver market share gains and productivity improvements, while maintaining a focus on tight cost control. In addition, COA announced on June 26th that it had reached a settlement with all three of its UK pension schemes. This announcement follows COA’s recent entry to the FTSE 250. Back on January 18th, the VectorVest stock analysis and portfolio management system flagged the value offered by COA shares across a number of key metrics, resulting in a high score on the VST-Vector (VST) master indicator. The VST indicator ranks every stock in the VectorVest database by calculating the square root of a weighted sum of the squares of Relative Value (RV), RS, and Relative Timing (RT). In January, COA registered a VST rating of 1.45 – excellent on a scale of 0.00 to 2.00, and when looking again today, we find the stock still logs a VST of 1.39, which is very good on a scale of 0.00 to 2.00. This is due to the improving performance and increase in numbers as illustrated in the results and trading statement. Today COA registers a current Value of 113p per share, and despite having hit our January target of 78p it remains undervalued at its current 76p per share. The chart of Coats is shown above using my normal notation. The green line study shows the VectorVest valuation while the blue line study shows earnings per share (EPS). The share has is on a Buy recommendation and has recently broken upwards through a previous high. Summary: The progress made by COA in 2017 is a classic illustration of the unlocking of value within a growth company. Once again VectorVest identified the opportunity back in January when COA traded at 57.5p, but even trading at 76p today, we see a lot more to come given the solid progress as outlined by the trading results, the recent entry into the FTSE250 and the solid technical picture. VectorVest upgrades the price target to 113p and reiterates a buy rating. Please note – although I am holding the share and expect further upside, the share may not be suitable for you. Readers can examine trading opportunities on COA and a host of other similar stocks for a single payment of £5.95. This gives access to the VectorVest Risk Free 5-week trial, where members enjoy unlimited access to VectorVest UK & U.S., plus VectorVest University for on-demand strategies and training. Link here to view.